On the 10th anniversary of 9/11, so much was covered on the deadly terrorist attacks and in remembering the loss of so many lives on that horrific day. MaryEllen Salamone lost her husband John on that day in 2001. But now, she prefers to celebrate 9/12 and the remembrance of how the community, the country, and the world came together to care and to serve. Since that attack, in an effort to help her three young children cope with the loss of their father, MaryEllen has been a 9/11 activist. She’s has been busy finding ways to give back. 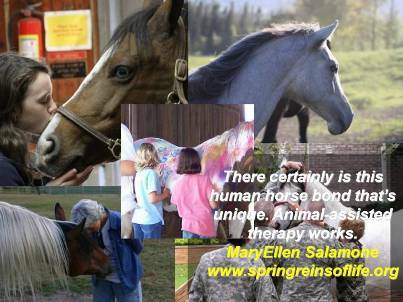 She served as president of Families of September 11; she’s served on the Board of the National School Center for Crisis and Bereavement; but she’s probably most proud of her work with Equine Assisted Therapy (http://www.springreinsoflife.org). Whether it’s in fostering horse/human therapy or speaking to schools, she’s dedicated to turning potential victims into empowered survivors. First as a mother and then as supporter of therapy for those suffering the loss of a loved one, she has taken a stand for survivor vs. victim thinking. I shared some of the same thoughts in my most recent op-ed column, Remembering the Days After. To MaryEllen, to stay a victim was to let the terrorists win. Instead, she involved her children in helping her make a difference for others. From collecting clothes for families of first responders lost in the attack to helping those suffering the loss of soldiers in Iraq and Afghanistan, she’s watched her children grow stronger as they served others. Remember, no matter what has happened to you, it does not control your attitude in facing the future. Don’t remain a victim; choose to be an optimistic survivor. Take the strength you have learned in past struggles to give you the confidence to face the challenges of today. If you want to be inspired, you won’t want to miss this moving interview with MaryEllen Salamone recorded just days before the 10th anniversary of 9/11 on KKZZ 1400 AM Radio in Ventura, CA. In fact, what are you waiting for? Download and listen to my second episode of Pocket Paulson. While you are there, don’t forget to sign up for future podcast episodes!